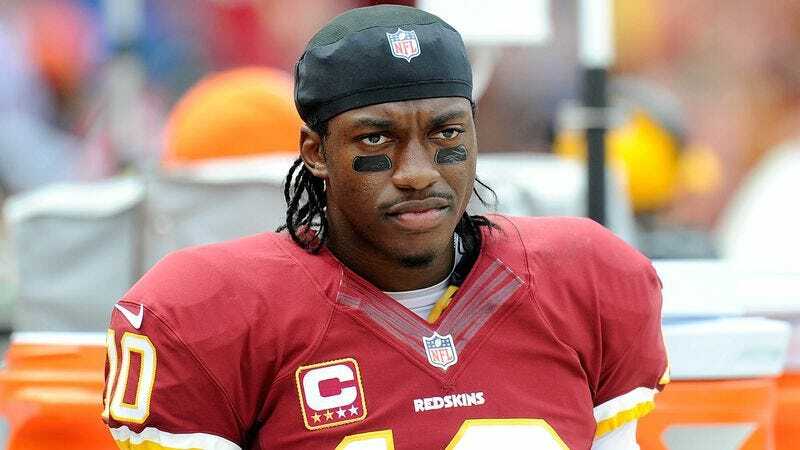 RICHMOND, VA—Saying that he makes a point to simply tune out the intense scrutiny from fans and the media, Washington Redskins quarterback Robert Griffin III stressed to reporters Tuesday that he will not allow any realistic assessment of his performance get to him. “I’m not about to let any objective criticism toward my play on the field distract me when I’m out there trying to win for my team,” said a determined Griffin, noting that he does his best not to give too much credence to the multitude of perfectly legitimate concerns about his regressing throwing mechanics, his middling ability as a pocket passer, and his increasing number of interceptions. “Look, I won’t be discouraged by unbiased, completely warranted critiques of my struggles within this offensive scheme or totally reasonable questions as to whether I’m naturally injury-prone. At the end of the day, I’m just focused on my game.” Griffin went on to say that he hopes backup quarterback Kirk Cousins is able to similarly brush off any heightened praise about his impressive displays during the preseason.